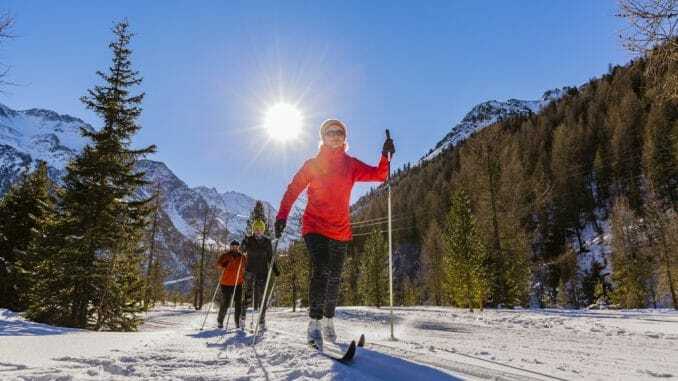 A family group of cross country skiers on a sunny winter morning in Italy Alps, Souty Tirol, Solda. Everyone is gearing up for the beginning of the snow season and if you have never skied but would love to give it a try, the month of October sees a wonderful introduction of 30 days of planned events to entice you into the wonderful world of skiing and snowboarding. These events are not only for first timers to see what all the hype is about its ideal for seasoned skiers to get their ski legs back in preparation for their beloved ski season. Over 30 days there are various events throughout England that will give an introduction plus plenty of advice about these energising winter sports. These events are mainly free or are at discounted prices as it returns for its fifth year. Snowsport begins on the 1st October and runs until the 30th with plenty of activities on the whole of the month at indoor ski centres, dry slopes, snowsports clubs and roller ski venues. There are more than 300 events on offer all over England and more events are expected to be added to the list. The 30 days of snowsports was first introduced in 2014 and has grown steadily with more than 6000 people enjoying free or discounted sessions in 2017 alone at various clubs and venues. Numbers for 2018 snowsports events are expected to exceed 6000 as this yearly event grows and becomes more popular with increasing campaigns to promote it. If you have never skied and you are a complete novice there are ski and snowboard beginner and taster sessions throughout all of October at the amazing Chill Factore in Manchester which is the UKs longest indoor ski slope. At the SnowDome in Tamworth, you can learn to ski and snowboard every day during October with their daily sessions and enjoy a free taster day at the North Staffordshire Ski Club on the 13th October. If you have always wanted to try roller skiing, take yourself off for the day to learn at the Dorney Lake in Eton on the 14th October. On the 20th October there is an open session held at the Manchester Cross Country Ski Club and roller skiing sessions will be held throughout the month in West Yorkshire. There are also open ski sessions being held at Chatham Ski and Snowboard Centre on the 20th and 21st of October. On the 6th October there is the Futures Project at Kendal Ski Club which is a day run by the GP Park and Pipe Team which is specifically for aspiring snowboarders and freestyle skiers. Add to that, taster and open sessions are also to be held at Kendal Ski Club from the 1st to the 30th October too. The 30 days of Snowsports include freestyle events, competitions, races, open days and taster sessions plus much more. These events are to encourage more people into trying the sports of skiing and snowboarding which are promoted by Snowsports England. It gives an insight into these sports and how they can be fun for the whole family to enjoy and take part in. During April 2019 sees the National Schools Snowsports Week take place to encourage school children on the slopes and into snowsports. The idea is introducing school age children at a younger age so it becomes part of their weekend activites, plus they are getting fit too! During the month of October its worth trying the different ski sports and venues as a family and before you know it you will be taking your very first ski holiday to the fabulous French Alps or Switzerland. Happy skiing, snowboarding, roller skiing or skating, whatever you choose simply enjoy it!